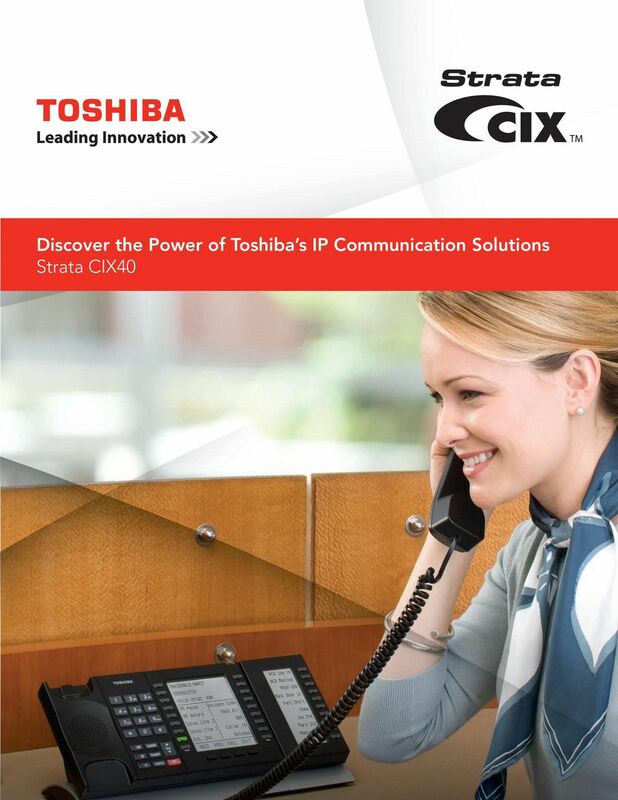 Download "Discover the Power of Toshiba s IP Communication Solutions Strata CIX40"
3 Choice of Endpoints Solutions for Every User The versatile Strata CIX40 supports all types of endpoints and devices, including a complete line of IP telephones, SoftIPT soft phones on notebook computers and smartphones, wireless IP telephones, add-on modules, DSS consoles, attendant consoles, as well as SIP telephones, analog telephones, and Toshiba digital telephones. 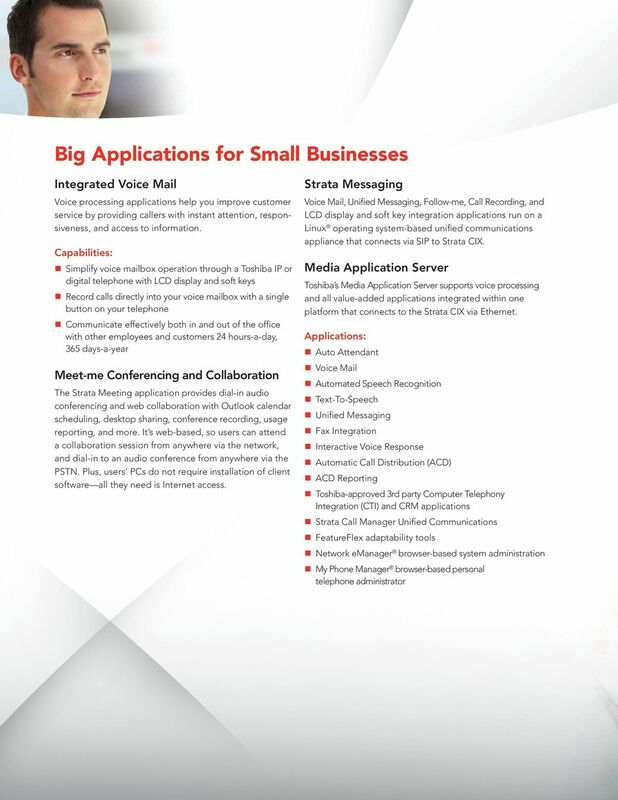 With the flexibility you want, you can build the communication system you need. 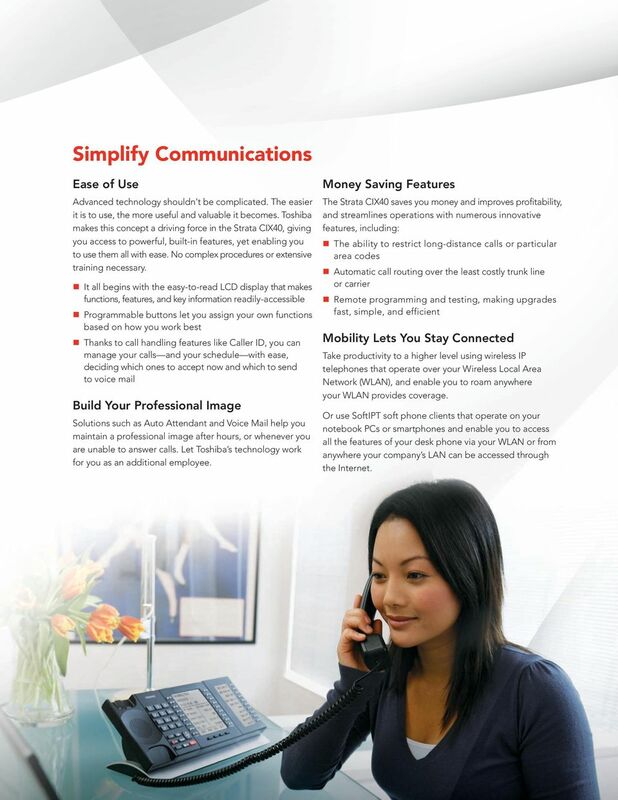 5 Simplify Communications Ease of Use Advanced technology shouldn t be complicated. The easier it is to use, the more useful and valuable it becomes. Toshiba makes this concept a driving force in the Strata CIX40, giving you access to powerful, built-in features, yet enabling you to use them all with ease. 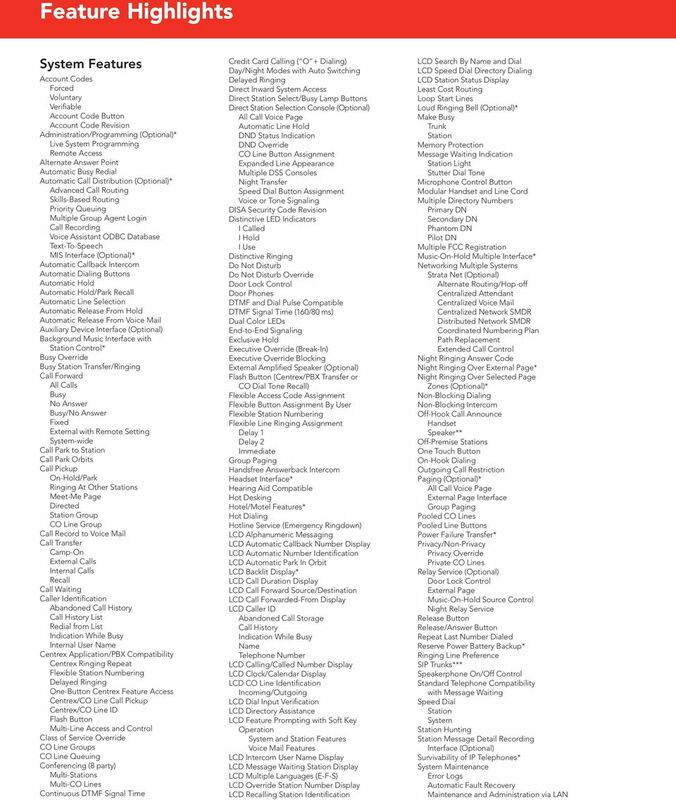 No complex procedures or extensive training necessary. It all begins with the easy-to-read LCD display that makes functions, features, and key information readily-accessible Programmable buttons let you assign your own functions based on how you work best Thanks to call handling features like Caller ID, you can manage your calls and your schedule with ease, deciding which ones to accept now and which to send to voice mail Build Your Professional Image Solutions such as Auto Attendant and Voice Mail help you maintain a professional image after hours, or whenever you are unable to answer calls. 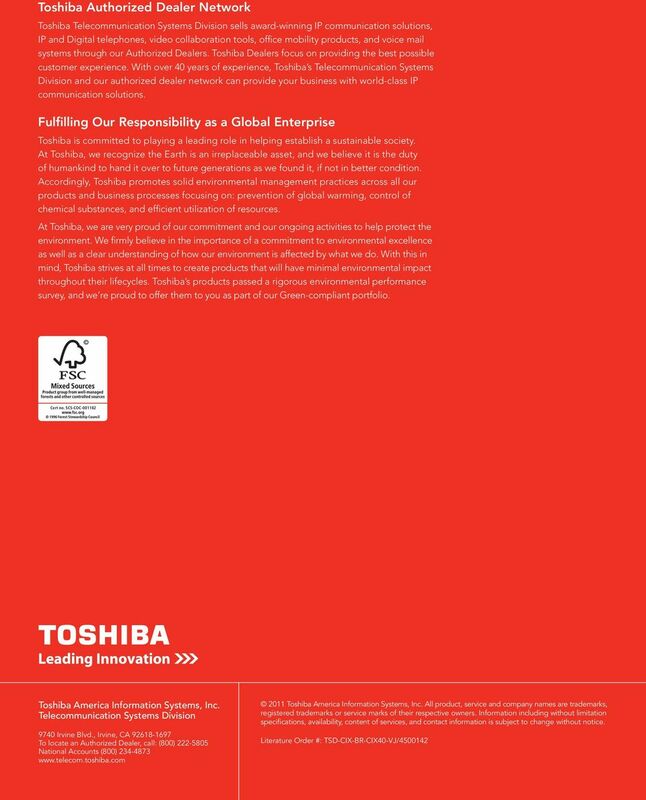 Let Toshiba s technology work for you as an additional employee. 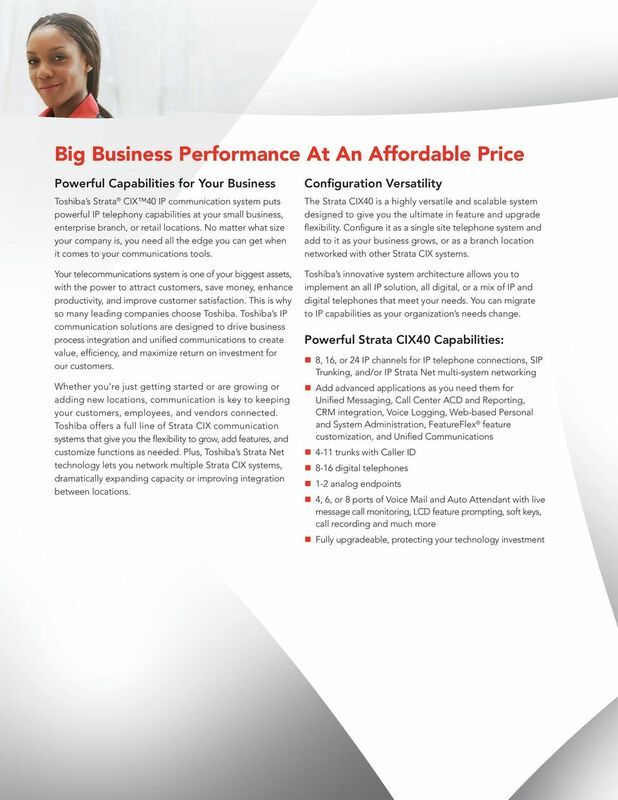 Money Saving Features The Strata CIX40 saves you money and improves profitability, and streamlines operations with numerous innovative features, including: The ability to restrict long-distance calls or particular area codes Automatic call routing over the least costly trunk line or carrier Remote programming and testing, making upgrades fast, simple, and efficient Mobility Lets You Stay Connected Take productivity to a higher level using wireless IP telephones that operate over your Wireless Local Area Network (WLAN), and enable you to roam anywhere your WLAN provides coverage. Or use SoftIPT soft phone clients that operate on your notebook PCs or smartphones and enable you to access all the features of your desk phone via your WLAN or from anywhere your company s LAN can be accessed through the Internet. 7 Feature Highlights System Administration Logs System Trace (Multi-level) SNMP Traps System Alarms (emonitor) Traffic Measurement and reporting System Program Upload/Download* Tandem CO Line Connections TAPI Compliant Tenant Service Toll (Destination) Restriction Restriction Override Restriction Override Revision Transfer Privacy Traveling Class of Service Uniform Call Distribution (UCD) User Programmable Feature Buttons Voice Mail Integration Call Record to Voice Mail In-band DTMF Signaling LCD Soft Key Voice Mail Control Transfer Direct to Voice Mailbox Voice Mail Conference Voice or Tone Signaling Volume Control Busy Override Tone Handset Handsfree/Speakerphone Ringing Voice Mail Features Audio Prompts Automated Attendant (AA) Automatic Message Copy with Optional Delete Called Identification (Name) Caller ID (Number) Caller Confirmation Prior to Transferring Call Monitor and Retrieve Call Record to Mailbox Call Queuing Call Screening Copy Mailbox Copy Range Directory Direct Transfer to Voice Mailbox Disk Space Notification Distribution Lists Do Not Disturb (DND) Extensions Scheduled Fax Tone Detection Future Delivery Guest User Mailboxes Independent Port Greetings Mailbox Function Lock Groups Security Code Personal Greetings Time Zone Setting Mailbox Number Varied/Fixed Length Message Continuous Delete Continuous Playback Date and Time Forwarding Notification Pause During Playback Pause During Recording Playback Control Private Purging Reply Retrieval Control Return Receipt Verification Speed Control Urgent Volume Control Message Storage Personal Folders Message Queues Multiple System Languages Paging Office Relay Remote Administration Reports Shutdown using the Telephone Dial Pad Single-digit Menus Soft Key Control with LCD Feature Prompting System Administrator s Mailbox System Backup Toshiba Plug and Play Integration User Tutorial (New User) Varied Sampling Rates Voice Forms Attendant Console Features Alarm Reset Answer Button Answer Prompting by CO Line Attendant Conference Setup Day/Night Mode Switching Busy Lamp Field (BLF) Display Station Directory Number Station User Name Station Advisory Message Display Call Answer Priority Call Statistics Incoming and Total Export to Excel File Print by Range Call Waiting Count Caller ID Display Calling/Called Number and Name Display Color CRT Display Dial O For Attendant Dial by Name/Number Dialing an Outside Number for Station User Direct Station Selection Directory Display and Dialing Directory Entry Attribute Information Directory Entry Contact Information Door Phone Calling Door Unlock DTMF Tone Signaling from Dial Pad Key Emergency Call Emergency Page Feature On-Line Help Flexible Programmable Buttons Headset Operation* Hold Calls Hold Timer Display Incoming Call Identification Interposition Call Transfer Join/Split Calls Keyboard or Mouse Operation Load Sharing of Multiple Attendants Loop Buttons Loop Hold Display Message Entry and Display to Station User Print Messages Message Waiting Set and Cancel Multi-Tasking Multiple Console Ringing Notes Entry and Display for Calls Overflow Override Position Busy Mode Remote Operator (IP connection) Release Button Speed Dial Calling Internal Calls External Calls Dial From Caller ID List Supervised Loop Operation Three-Way Calling Through Dialing Transfer Direct to Voice Mailbox Trunk Group Control and Busy Indication Trunk Test and Verify Windows PC Operation Note: Optional features may or may not be extra cost items. 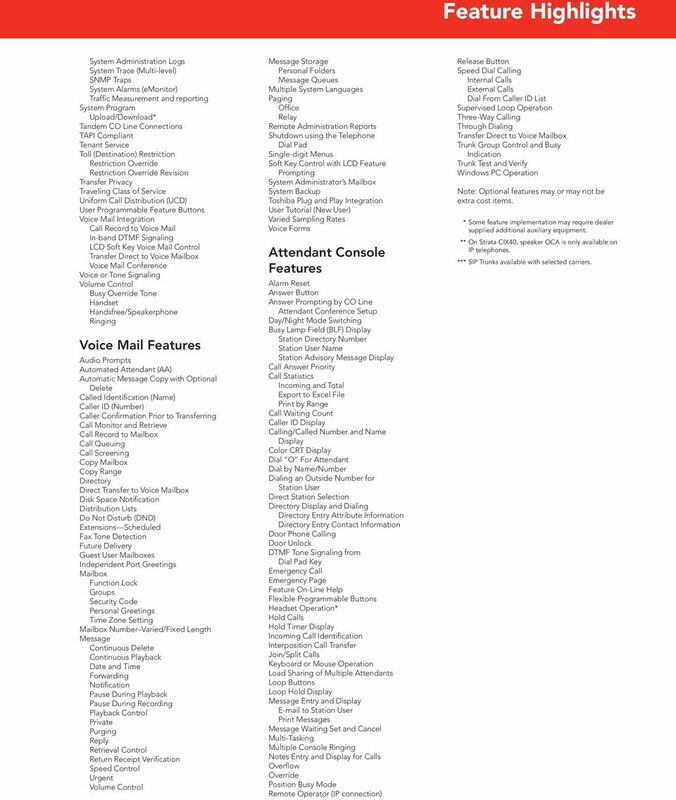 * Some feature implementation may require dealer supplied additional auxiliary equipment. 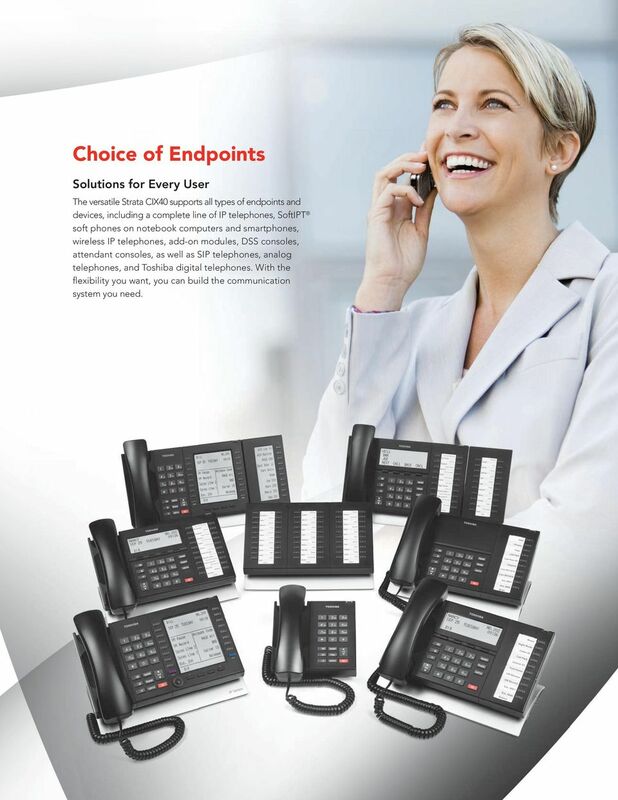 ** On Strata CIX40, speaker OCA is only available on IP telephones. *** SIP Trunks available with selected carriers.